I think we’re going to make it. When I put up last week’s post, I had just finished dyeing one category of Rainbow cottons. Since then, I have finished all the Rainbows, Midnights, Purples, Blues, Oceans, Greens and Forests. I just need to dye Goldens and Fruities and I’ll be done. My daughter has started the rinsing, washing, drying and folding. I will be helping with that once the dyeing is done. Actually, I’m already helping. There was still one load in the dryer when I took my daughter home this evening. That load is mine to fold. The dyeing is done outside, so I have to stop when I lose the light, but folding can be done way past bedtime, if necessary. It’s not way past bedtime yet, but if I don’t hurry up and get this blog post done, it will be. I suspect this may end up being a short blog post. I do want to give a shout-out to Hall’s Nursery, though. They sure saved our dyeing day today. When I inventoried all my dyes and chemicals at the beginning of the season, I thought I had enough urea to make it through the festival dyeing rush, so I didn’t add any to my order. By last weekend, I was starting to worry about that decision. 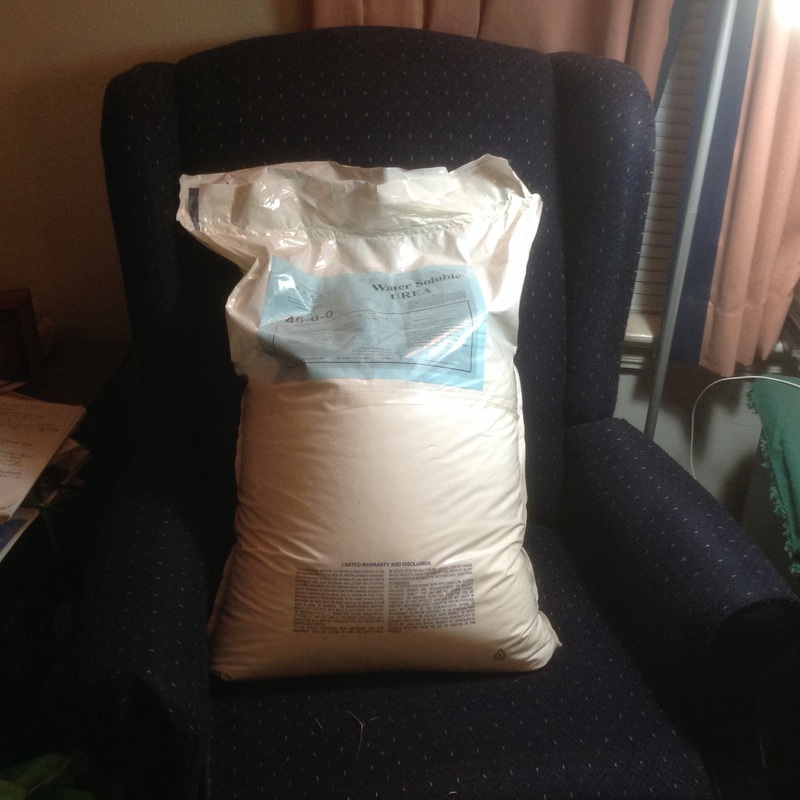 I went to our dye supplier’s website to look into the possibility of getting more urea, but even at the slowest and least expensive method of shipping, it would have cost more to ship it than to buy it. To get it here in time to make a difference, it would have cost two or three times as much to ship it as to buy it. I had read that it should be available at farm supply stores, so I asked my daughter to look into the possibility of buying it locally. Farm supply stores apparently do not have sophisticated websites. Some of them don’t even have phone numbers listed online. My supply of urea was getting lower and lower and I was getting more and more worried about running out. This morning, my daughter came to me with a big smile on her face and told me she had talked to someone at Hall’s and they had urea in stock. We didn’t even have to drive to the outskirts of town to get it. There’s a Hall’s Nursery within a few miles of my house. The urea they carry at Hall’s only comes in one size. I am no longer worried about running out. This entry was posted in Uncategorized and tagged Hall's Nursery, tie-dye, urea on May 18, 2016 by releaf1954. It’s actually a source of nitrogen, which is why it’s in farm supply stores, but we use it in our dye mixtures to help the dyed things stay wet while they’re batching. They say it makes the colors brighter. Cool! My science lesson for the day.